Two years ago, I sat with my mother while she died. She’d been dying a long time. Our family is touched with what we call the ‘gypsy curse’, the BRCA2 gene mutation which affects about one of every forty individuals with Ashkenazi Jewish ancestry. Lots of our family members have died – most of them, horribly. My aunt sat with her mother as she died and she told me that she remembered her screaming upstairs, her body encased in plaster as the cancer spread from her breast and raged through her body. Upstairs, like a dirty secret, she said. Like every other Australian, I think that we should be able to die pain free, with dignity. Unlike some other Australians, I can’t support assisted suicide legislation. The reason? I am a disabled woman with a degenerative disability. The news that the Greens will introduce an assisted suicide bill has been welcomed by many members of the community, including my own. Like all communities, the disability community is divided on the subject of how to die. But for many of us, the proposal is targeted directly at us. Degenerative disabilities are often conflated with terminal illness so seamlessly and ingeniously by the media that our deaths are seen as inevitable and desirable. Popular fiction romanticises our deaths and paints disability as a tragedy. The idea of our ‘suffering’ is based on the perspective of non-disabled people, as are ideas about our ‘quality of life’. I listen to people talking carefully about safeguarding and the authority of doctors and I am terrified – not just for myself, but for the people in my community. You might not understand that, but that is because you do not know what we know. For us, this is personal. This is why I’m afraid. In February, a man in our community with muscular dystrophy woke up from routine surgery with a DNR band around his wrist – despite never having ordered it and never writing an Advance Care Directive. 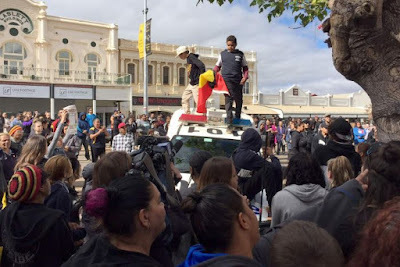 In June, we joined with Australian and international protestors and protested the movie ‘Me Before You’ at a cinema in Perth. The film is about a quadriplegic who kills himself at a Swiss suicide clinic, despite having millions of dollars, a supportive family, the love of Emilia Clarke and a castle and jet. The message is that the lives of disabled people are not worth living, that you’re better off dead than disabled. I took a prop tin that said ‘Send me to a Swiss Suicide Clinic’ and jokingly shook it at the nearest able bodied person – half an hour later, I was no longer grinning. Not one single patron asked me why I wanted to die – not a single person asked if I was okay. Not one person refused. Some people told me that they understood that I might want to die, because it would be terrible being a wheelchair user, and that it was ‘my choice’. And at the end of the night we had raised over a hundred dollars, which we donated to a suicide bereavement fund. In July, a Japanese man, Satoshi Uematsu, broke into a facility for the disabled in a small town near Tokyo and stabbed 19 people to death whilst they slept. 25 others were wounded. Uematsu had written a letter to the Japanese Parliament a month before, saying that he envisioned a world where a person with multiple disabilities can be euthanised with permission from their family members. The massacre is Japan’s biggest mass killing since World War II, but it raised barely a ripple amongst mainstream media. There were no changes to people’s profile pictures, no hashtag. The victims remain unnamed. In August, I attended the Melbourne ABC studios with other activists to speak with Peter Singer, who believes that parents should have the choice to legally euthanise their disabled infants. His views are that parents and doctors should be able to ‘take active steps to end a baby’s life swiftly and humanely’. Activist Kath Duncan asked if his views were not dog whistling violence to people like Uematsu and Singer vehemently denied that idea. And on the way out, he stopped to chat. I told him that I agreed with the late Harriet McBryde Johnson, who also had a degenerative disability – my problem is that Singer thinks that it would have been better if I was not born at all. His response was chilling – if you’ve read that essay, he said, then you know my views. And then he moved on to a polite conversation about how long he was in Australia and how he would be visiting with his sister. Last week, I wrote a paper about hate crimes against disabled people and how our murders often go unpunished. I wrote about Kyla Puhle, whose mother, Angela, walked free from a South Australian court after pleading guilty to starving her to death. Peter Eitzen, stabbed to death by his mother Beverley. Jason Dawes, who was suffocated by his mother – she walked free in to a paid interview with Ray Martin. There were no penalties or jail time and the rhetoric around the deaths of disabled children is often the language of ‘burden’ or ‘mercy killing’. And four days ago, disabled people mourned the death of Jerika Bolen, a fourteen year old teen with spinal muscular atrophy who died in hospice after requesting help to end her life. Her mother held a fundraiser to support her dream of a ‘last dance’ prom and her request to die was praised by her grandmother as ‘unselfish’. The media used words such as ‘brave’ and ‘inspirational’. And few people asked the questions that most others would ask of the death of a non-disabled teenager, about pain management, medical care, availability of counselling. Instead, they threw a party and watched her die. All those things have happened to us within a few short months. Each event has reinforced the message that our lives are not worth living. Blow by blow, one after the other. You can imagine the effect this has on the psyche of a disabled person - for me, it's like the sound of a gold coin donation dropping into a charity tin rattled for the purposes of hastening my demise. – “It is hard to argue that each of us possesses equal human worth to anyone else, when society still widely views us as inferior. Notably, government itself has styled this state of affair as one of social apartheid. – “It is hard to argue because many of those things that we live with daily involve the sort of intimate care and support that many euthanasia proponents try to escape. – “We don’t experience indignity when receiving good support. Euthanasia proponents cannot conceive of that. – “It is hard to be heard when our perceived ‘quality of life’ is painted as unbearable, while we want to live life. 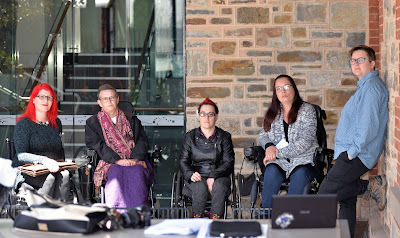 – “It is hard to be heard when your disability involves cognitive impairment, isolation and marginalisation, especially while we know that euthanasia supporters want to do away with such experiences of life by ending it. – “It is hard to argue as, when we argue for the fair share of control, self-determination or autonomy that society withholds from us in trying to live our lives, euthanasia proponents use exactly those points in arguing for a right to die which, in our case, might become an obligation. Our voices are smaller than the rest of the Australian population. Erik was right. Non-disabled people make value judgements about the quality of our lives. We are unsupported and the worth of our lives is often counted in dollars. Advocacy is being slashed across the nation, as we speak. Non-disabled people are terrified of disability. Activist Liz Carr says that legislation should not be passed because of fear – it should be passed to keep people safe. That’s true, and there’s another truth that we’re not discussing. Unless we pass laws to assist disabled people to live – to live a good life, with the support we need to be who we are - we can’t pass laws to assist them to die. I write to you, Colleen, to Premier Daniel Andrews and other decision makers and ask that you shift your focus to the population most at risk, the disability community. I ask that you make a commitment to assist us to live with dignity before turning your efforts to ways to help us die. Thank you Sam, spot on. If you're looking for the best Bitcoin exchange service, then you should use Coinbase.